Started-in on the main rocky patch off crap-dirt where not much grows. In the summer when the rest of the grass is a foot high, this ten-foot square area is just a bumpy, scrubby, dust-bowl and the mower kicks-up rocks and dulls the blade. Kicking up rocks around here can also spark a fire, so leveling it out is another safety precaution. There’s another similar-sized patch off to the left, but this one is close to the drainage cut I’m making, and anyhow there’s always more work to be done if you look for it! 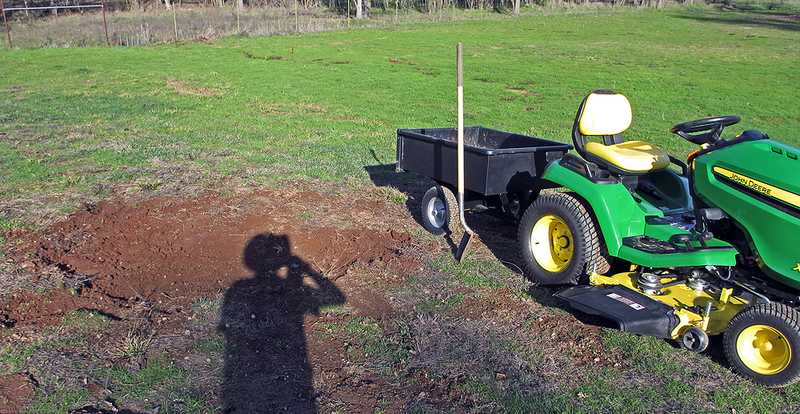 I wish there was a contraption I could pull behind the mower that would gather up rocks and gravel while leaving the nice soil behind, but I’m not aware of such a thing – even for a big tractor. 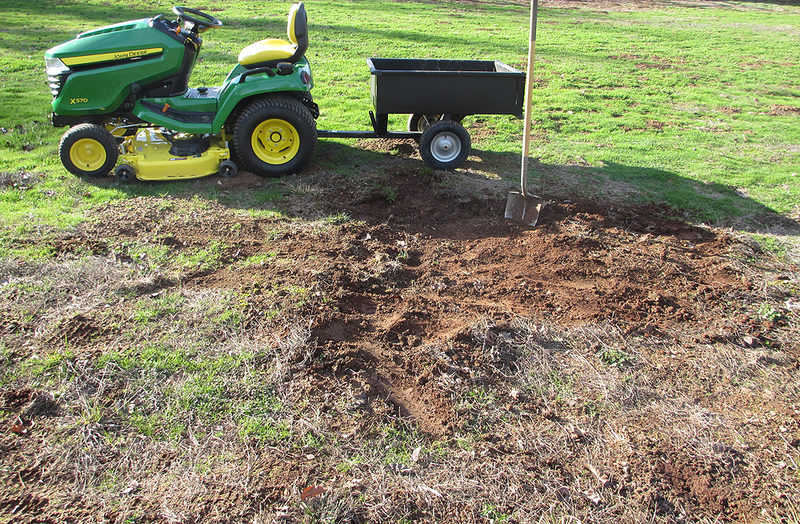 If there was it might justify buying a tractor to do this job, but since there is not it’s just me and the shovel. When I finished with the shovel I spread a lawn-patch mixture of seed and fertilizer on it, in case I don’t get around to filling it with turf cut out of the drainage channel. Up in the corner of the property, underneath the old pine tree and by the fence, is a kind of junk ditch that may have been the old burn pile. Anyhow that’s where the rocky crap-soil is destined. The small mower couldn’t make it up the hill because of the clearance, the slippery pine needles, and the scrub oaks, so the big John Deere (with locking differential) was called out. 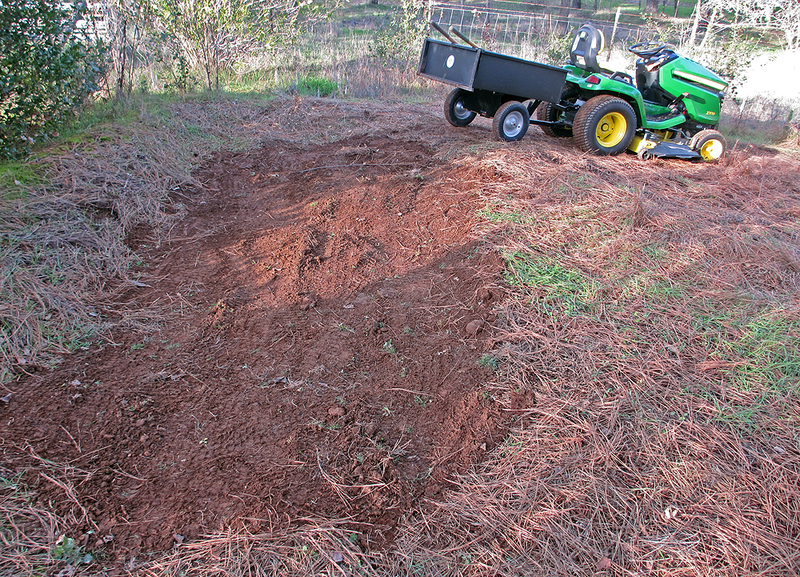 I made about six runs with the dumper wagon half-full (because of the weight), and there’s always more to do but at least it’s a start. You can’t really see the wide ditch from the picture because of the combination of angles, hillside, and lighting, but it’s about as wide as the fresh dirt and rocks. Six half-loads was a pretty good job, but it’s all soft and there is room for more. Rain possible today at 3:30, so maybe a bit more work is in order while I have the cool pleasure of an overcast day. UPDATE: Got outside where the temperature has already peaked at 51 and dropping as the storm comes in bearing Sierra snow. I bent over to move some rocks by the fence and my back called-up to remind me of my current age and decrepitude. Between shoveling and bouncing around on the John Deere yesterday I probably should have worm my motocross kidney belt, but it doesn’t match the yellow and green color scheme. Anyhow there will be more time for more stuff after the rain blows through. You need a rock picker, or a golf ball picker (works on the range for brass, too). Sounds like you need to rent a Bobcat and landscape rake. Youtube has videos of it in action, or go to Bobcat.com. I’ll check it out, thank-you for the heads up!